The Home Depot Foundation is a huge supporter of our veterans' programs, below is a brief list of what they have done to help those in need! In October, 2012 Team Depot from Biddeford Home Depot provided and constructed a building on the grounds of Arthur B. Huot House in Saco for the use of the residents/veterans. They installed a rock wall garden, painted hallways inside, and painted/reshingled the shed at Huot House. In the Spring of 2016, Home Depot Foundation donated $225,000 to Volunteers of America for equipment, appliances and other essentials for the Cabin in the Woods, veterans housing. 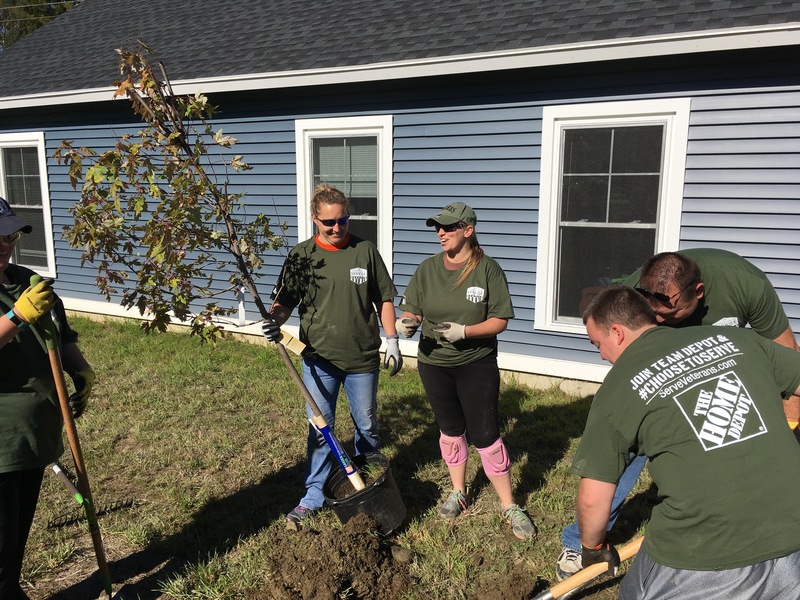 In the Fall of 2017, Team Depot of Concord, N.H. provided and constructed a gazebo for the residents/veterans of Richard Brown House in Loudon. In the Fall of 2018, Home Depot Foundation provided $27,000 for a whole house generator for the residents/veterans of The Country Villa in Bangor. In the Fall of 2018, Home Depot conducted their annual Celebration of Service at Cabin in the Woods, with over 80 Home Depot volunteers spending the day beautifying the grounds with landscaping, including the planting of trees and bushes which they provided.